Pinterest lead me to a great idea for our guest bathroom! Ever since moving in, I've wondered what I should do about the shower curtain situation. The shower/tub requires a extra long shower curtain, but I didn't love the idea of something plain and white. It's hard to see, but look over to the left. Someone spent a lot of money on a custom floor to ceiling curtain and valance around the shower..... in the 90's. That came down the day we closed. Awesome, right? 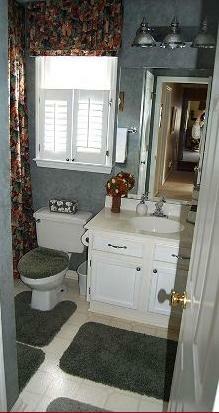 In fact the bathroom layout look somewhat similar to ours. But let's be honest, I'd rather spend the money on nice tile for the floors than custom drapes. And we do plan to have a baby someday.. those fancy drapes seem like they'd be a headache during bath time (not to mention we give Charlotte baths in this bathroom which can get kind of messy). I even own a plain white shower curtain that I can use, so all I need for this project is a little bit of fabric (and a new rod). Sweet! Since we keep things real around here... who knows when I will get around to this. But it's nice to know I have a plan! Thanks again Pinterest for being awesome. It's like you were reading my mind, Bryn! I'm desperate to liven up our bathroom, but since we rent that means any change has to be able to move with us! I love the idea of jazzing up a white shower curtain with a fun print! Full sheets also make a nice extra long shower curtain. You can add grommets or just sew button holes. As far as adding fabric to the bottom just make sure it is a similar weight to your curtain. I have seen some wonky looking ones when the border is heavier or lighter weight. I love that blue bathroom - just lovely! Bryn, it is a gorgeous bathroom. That cabinetry and tile and light fixtures! In love. love it! it is the perfect way to add a little something to a plain fabric without over-powering the room! i did the same thing in my family room...all with stitch witchery (i dont sew:) thanks for sharing! Oh that tile! I'm crazy about it. Off to pin for kitchen inspiration. Another reason I love Pinterest. Great idea, can't wait to see you make it come to life. It comes in a few other colours too, including a luscious indigo! I LOVE that whole bathroom! That cabinet?, those Moroccan tiles on the tub? Super pretty! Even the raspberry color which normally isn't my thang. So awesome! Love the Pintrest bathroom! Those tiles are amazing. Never thought a pink bathroom could look so sophisticated. Excuse me while I go all nerdy on you here (I'm a ventilation engineer).. 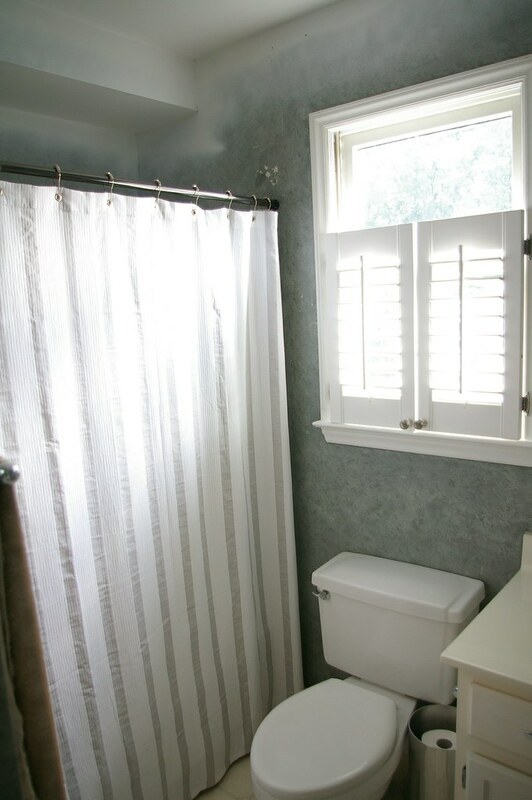 I can't tell where your exhaust fan is, but if it's not directly above the tub itself then you are better off leaving the top of the curtain open as shown in the Pintrest bathroom. That way the steam from your shower will have a better chance of being exhausted out of your bathroom, reducing your chance of a moldy shower ceiling. I'd only add a valance if the exhaust fan was actually in the shower. Love this idea! Thanks for sharing! Finding floor-length curtains is tough and I often have to make my own. I recently discovered C&B's Marimekko tablecloths are the perfect width for a standard shower stall and come long enough (up to 113"!) to do ceiling to floor. I had a similar situation in my house, and know what I did? I don't have "fancy pants" money to do a custom curtain and all I could find was a nice crisp extra-long white waffle-weave shower curtain at Target.com. So I took the white shower curtain to a local embroidery shop and had them monogram the largest "G" (first letter of our last name) that they could do in the thread color I selected in the middle of it. It looks amazing and expensive! This idea you got about sewing the fabric onto the bottom is genius - and something I could totally add to my monogrammed curtain for an even more "custom" look! Love it! This is awesome!! Just added the image to my pinterest, too! It is sooo hard to find great shower curtains and I feel like buying yards of beautiful fabric for a curtain could bring up costs too much. This is a great compromise! Bryn, You are so funny. I thought the bathroom was great. I just remember how wonderful it smelled. It looks like you have some fun plans for it. I can't wait to see what you do! I'm in love with Pinterest right now for the same reasons. So much inspiration to find! This will be a great compromise for the shower curtain, though I do love the modern valance! Bryn this is the perfect solution!! It will be beautiful! I just discovered Pinterest myself and haven't quite figured it out. Homegoods and Target are good starts for shower curtains. Anthropologie has some gorgeous ones too, if you can afford the price tag. i love this inspiration photo - the curtain is great - and that tile is one I've been lusting after for sometime. Oh your guest bath photos are too funny - we just started demo'ing our guest bath and it consists of awful marble navy blue pattern wallpaper - I feel your pain! I too feel your pain! When we first moved into our little English house the guest bathroom was painted purple and there was a 'fishbowl' toilet seat! Nothing says 'classy' like a clear plastic toilet seat with little plastic fish trapped in it! That was the first thing to go! Your inspiration photos are indeed lovely and inspiring! What a great inspiration photo! I can think of so many bathrooms that are typical builder bathrooms that could be easily updated with these ideas- paint, mirror frame, tile, light fixtures, crown molding, shower curtain- they could be put in place without doing a full renovation and provide such an impact!